Carmine's, the New York family-friendly Italian eatery, has opened its first West Coast location in the Forum Shops at Caesars. The two-level, 27,000-square-foot space replaces the relocated Planet Hollywood restaurant and is the largest restaurant without a nightclub in Las Vegas. Walls are lined with thousands of photographs of families and the 700-seat dining rooms are lit with antique chandeliers. Family-style entrées are meant to serve three to five people. The menu features linguine with clam sauce, rigatoni "country style," a nine-inch-high eggplant Parmigiana, and beef, veal and chicken dishes. Over-size desserts include the "Titanic sundae" with chocolate cake, five scoops of ice cream, pineapple, cookies and whipped cream. Carmine’s, 3570 Las Vegas Blvd. S., Las Vegas, NV 89109, 702-473-9700. Bally’s Las Vegas and ESquared Hospitality have opened BLT Steak. The classic steakhouse has taken over the space of Bally’s Steakhouse and also expands to 9,300 square feet, offering seating for 250 with a curved bar, two separate dining rooms accommodating 100 guests, and two private dining rooms. BLT Steak first opened in New York in 2004. BLT staples include tuna tartare, chopped vegetable salad, Dover sole, USDA Prime and Certified Angus steaks, and peanut butter and chocolate mousse. Weekly blackboard specials highlight seasonal flavors and local ingredients, and the wine list features more than 500 wines with selections from the regions of Burgundy, Bordeaux, Piedmont, Tuscany and Rioja, among others. BLT Steak, Bally's Las Vegas, 3655 Las Vegas Blvd. S., Las Vegas, NV 89109, 702-967-7258. Chef Tony Gemignani will open Pizza Rock in downtown Las Vegas later this summer, featuring gourmet pizzas, hand-crafted artisanal cocktails and an extensive imported beer and wine list. The restaurant will offer a variety of pizza styles, such as Neapolitan, classic Italian, classic American, Sicilian, Roman and gluten-free; it will also feature Gemignani’s Burratina Di Margherita --- burrata cheese, cherry tomatoes, basil, extra virgin olive oil and balsamic reduction. A selection of pastas, antipasti and salads will be available, all made with authentic Italian ingredients and organically grown produce. The location at 201 N. 3rd Street, two blocks north of the Fremont Street Experience, is part of the Downtown 3rd neighborhood and is adjacent to the new Downtown Grand. Pizza Rock will be open daily for lunch and dinner, and a Sunday brunch will be served from 10 a.m.-2:30 p.m. Pizza Rock, 201 N. 3rd St., Las Vegas, NV 89101, no phone. Chef Shawn McClain has branched out into casual dining with the opening of Five50 Pizza Bar at Aria Resort & Casino. Located in the casino adjacent to the Race & Sports Book, the décor features a large mural by CYRCLE (a Los Angeles-based street artist collective) and walls filled with a faux chalkboard listing beers on the menu and fun sayings such as, “Beer makes you feel like you ought to feel without beer.” The menu includes small plates, salads, pasta and charcuterie. The restaurant’s name is derived from the temperature at which the wood-fired pizzas are cooked. Eight signature pizzas are offered, such as the truffle --- potato, truffle salami, bechamel, parmesan, thyme and truffles. An expansive craft beer list with 12 taps and 34 bottle beer selections offers a wide range of beer styles. Five50 Pizza Bar is open daily from 11:30 a.m.-midnight; a slice counter is open from 11 a.m.-2 a.m. Five50 Pizza Bar, CityCenter, 3730 Las Vegas Blvd. S., Las Vegas, NV 89109, 866-359-7757. Akira Back, executive chef at Yellowtail Japanese Restaurant & Lounge at Bellagio, has opened his second restaurant in Las Vegas, Kumi Japanese Restaurant + Bar at Mandalay Bay. The restaurant features a modern Japanese menu with a Korean American twist. Back was born in Korea and raised in Colorado, and was a professional snowboarder before joining the culinary ranks. Since then, he has worked with top celebrity chefs including Masaharu Morimoto and Nobu Matsuhisa. The new restaurant offers seating for up to 300, a sushi bar, various dining areas and design elements including giant interpretations of cherry blossom trees and glazed cobalt-blue tiles in a scalloped pattern inspired by common Japanese homes. Kumi Japanese Restaurant + Bar, 3950 Las Vegas Blvd. S., Las Vegas, NV 89119, 702-632-7777, 877-632-7800. Silverado Steak House at South Point Hotel, Casino & Spa will celebrate National Filet Mignon Day by offering a three-course menu for $49. Available August 11-15, courses include a choice of lobster bisque with cognac or a wedge salad; a main course of six different filet mignon options including the rossini ---topped with duck liver, black truffle and Madeira sauce; and dessert of hazelnut mousse with fresh seasonal raspberries or a scoop of ice cream or sorbet. Silverado Steak House, 9777 Las Vegas Blvd. S., Las Vegas, NV 89183, 702-796-7111. Japonais, Fin and Onda restaurants at The Mirage will temporarily close July 30. All three restaurants will reopen August 8. The Mirage, 3400 Las Vegas Blvd. S., Las Vegas, NV 89109, 702-791-7111, 800-627-6667. Las Vegas Restaurant Week will run from August 23 through August 30. More than 100 of the city’s finest restaurants will offer a three-course prix fixe menu priced at $20.13, $30.13 or $50.13, with a portion of each meal donated to Three Square, Southern Nevada’s only food bank. Beginning August 8, a visit to www.helpoutdineoutlv.org will offer a list of participating restaurants and menus, and a capability to search by cuisine, location and price. Carla Pellegrino’s Bratalian Neapolitan Cantina is offering a three-course prix fixe dinner for $29.99 Monday through Saturday from 5 p.m.-7 p.m. until the end of August. Patrons can choose from seven appetizers, eight entrees and four dessert options. Bratalian Neapolitan Cantina, 10740 S. Eastern Ave., Ste. 155, Henderson, NV 89052, 702-454-0104. Fogo de Chao is offering local residents with valid Nevada ID a free bottle of wine wine with the purchase of two regularly priced lunches or dinners. The offer is for the house-label Malbec that normally sells for $84. Those who don’t drink wine can opt for a free dessert. The restaurant is also offering a free meal for kids 12 and younger on Sundays through Thursdays, with the purchase of a full-priced adult lunch or dinner. Fogo de Chao, Hughes Center, 360 E. Flamingo Rd., Las Vegas, NV 89169, 702-431-4500. Fleming’s Prime Steakhouse & Wine Bar is offering its summer Taste the Season two-course prix fixe menu through August 31. Priced at $40.95, the menu features chili-lime prawns with ancho-pepper sauce, followed by filet mignon with warm rosemary and goat cheese mousse paired with pecan-crusted Scottish salmon in a Dijon mustard and tarragon sauce. 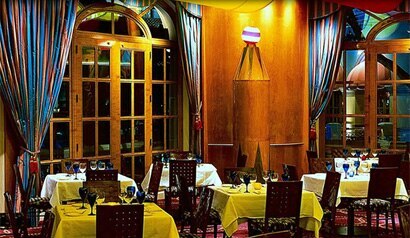 Fleming’s Prime Steakhouse & Wine Bar, Barcelone Plaza, 8721 W. Charleston Blvd., Las Vegas, NV 89117, 702-838-4774. Natalie Grimes will be leaving Rao's in Caesars Palace to take on the executive chef position at the new Rao’s in Hollywood, which will open in late summer. Grimes will remain at the Caesars Palace Rao’s, training the Hollywood location’s staff until just prior to opening. Rao’s, Caesars Palace, 3570 Las Vegas Blvd. S., Las Vegas, NV 89109, 702-731-7267. The upstairs fine dining portion of Rick Moonen’s RM Seafood at Mandalay Bay closed May 3 for a remodel and rebranding, and has reopened. The new concept is named RX Boiler Room, a steampunk-inspired restaurant and lounge, with décor reminiscent of industrialism during the 19th-century Victorian era, and redefined comfort food classics and handcrafted cocktails. The downstairs casual dining RM Seafood venue remains open. RM Seafood, Mandalay Bay Resort & Casino, Mandalay Place, 3930 Las Vegas Blvd. S., Las Vegas, NV 89119, 702-632-9300. The announcement that Circo at Bellagio will be closing next spring continues the trend of fine dining venues going by the wayside, giving way to more casual eateries by well-known chefs, which are opening on the Vegas Strip on a regular basis. Circo opened its Las Vegas location in 1998. Circo, Bellagio, 3600 Las Vegas Blvd. S., Las Vegas, NV 89109, 702-693-8150.